Wally Byam never led a caravan in Asia as far as I know, but since his time Airstreamers have roamed around that continent a few times. There was a very notable exchange program with China in the 1980s, where Americans were able to travel in the country by Airstream and some Chinese came here, but otherwise not much has happened there, Airstream-wise. That has been changing recently. Airstreams have been sold in Japan in small numbers for over ten years, and in the past two years Airstream has opened dealerships in Shanghai, Beijing, and Seoul. They are also selling Interstate motorhomes in Thailand, to wealthy types who spend a lot of time in traffic. Korea is interesting because there’s already an established RV culture in that country, but of course even though China has virtually no RV infrastructure you can’t disregard it. With billions of people and centralized policy-making, you never know. Tomorrow they could announce a huge initiative to build 100,000 campgrounds. To me, the really interesting part of Airstream in Asia is that anything might happen. Applying North American or even European expectations to Asia is an exercise in futility, so undoubtedly we will all be surprised by how the Asians interpret our “American icon.” Already a high-end Airstream glamping site has been built in Inner Mongolia (next to the only golf course in Inner Mongolia, I’m told), and none of us saw that coming. I decided last winter that this was the year to go to Asia and see the early sprouts of a new Airstream culture emerging. We are leaving on Friday. I will meet with two or three of the Asia dealers and pick their brains about what is happening. I’ll take photos and notes, and slurp noodles while contemplating it all. I don’t yet know what I’m going to do with this knowledge (politicians call this a “fact-finding mission”) but I don’t think that matters. Sometimes you have to go seek answers even when you don’t know the questions yet. Planning this trip has been without a doubt the most intense trip-prep we’ve ever done as a family. It has been months of scheduling, saving, and research. Our itinerary calls for seven major stops including Shanghai, Beijing, Incheon/Seoul, and Tokyo, plus lesser stops in Kobe Japan, Vancouver Canada, and Honolulu Hawaii. And for most of it we’ve had to arrange planes, trains, automobiles, and ships from 12 to 13 time zones away. I’ve got instructions for taxicabs in three different languages and hotel reservations in three different currencies, plus subway and rail maps for five cities, and meetings set up with people I’ve never met. We’ve got new Passports, new luggage, Chinese Visas, trip insurance, an envelope full of renminbi (Chinese money) many useful apps on the iPhone, and typhoid vaccine in our tummies. People have been giving me lots of advice and warnings for this trip. I’ve been warned about protests in Hong Kong, typhoons in the Pacific, malaria in the countryside, dishonest cabbies in Seoul, air pollution and traffic jams in Beijing, crowded subways in Tokyo, and the importance of bringing one’s own toilet paper. Toilet paper, mosquito repellant, air-filtering mask: CHECK! Some of the most useful advice has been regarding gifts, which are an important part of business in Asia. After careful consideration, we are bringing some nice art for the people we meet. 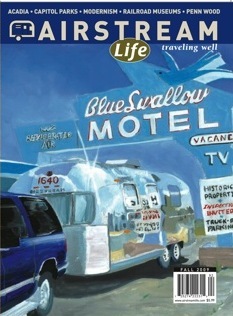 I’ve selected some cover art from prior issues of Airstream Life and asked the artists to provide matted prints, which fit well in our luggage and are relatively light & unbreakable. Eleanor wrapped them in red paper in such a way that border agents can examine them if needed without tearing them open. I’ll be bringing works by Michael Depraida, Michael Lambert (below), and Don Lake, and they will be hanging in Airstream offices in Asia after we leave. We chose red wrapping because it’s considered an auspicious color. And speaking of colors, one tip that kept me out of trouble was about green hats. Apparently there’s a saying in Chinese about a man who wears a green hat, which implies his wife is cheating on him. Before I heard that I was very close to bringing a few Airstream Life hats (some of which are green), and even wearing mine while traveling, but I guess I’ll choose headwear that doesn’t malign our marriage. It’s all very interesting to me. The hassle of setting up the trip is really already worth it, because I’ve learned so much. There will be much more to share as we go. Internet will be at a premium during this trip, so my blog entries will be infrequent, but I do hope to at least post once or twice. If that doesn’t work, I’ll post after the trip is over and pre-date all the entries as I did on last summer’s motorcycle trip. I hope you enjoy following along! Ahhh, the world of A/S Life, much like the universe, continues its infinite expansion. The growing legion of loyal blogees will anticipate entries with bated (baited) breath; whatever that means. Safe travels to the three of you, guaranteed to be trying and gratifying…the ultimate challenge to your ten years of roadworthiness. No green hats, no green cheese. I wish you all a great time and I can’t wait to read more!